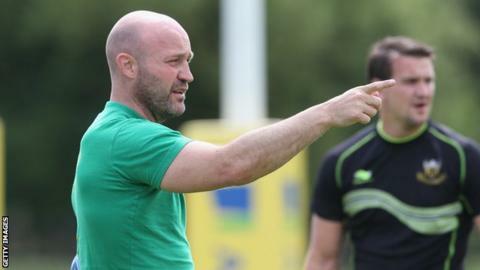 Northampton Saints coach Alex King has said the re-emergence of his former side Wasps is good news for England. Wasps will play in the European Rugby Champions Cup for the first time in four years this season after a series of disappointing Premiership campaigns. "It's good to see Wasps strong again because they always produce good, young English players," King, 39, told BBC Radio Northampton. "I think it's important for the English game that they are strong again." King played at fly-half during the most successful period of Wasps' history between 1996 and 2007. He was part of four Premiership title successes and two Heineken Cup victories during those years. But they have been trophy-less since claiming the league crown in 2008 and have faced financial problems, a relegation battle in 2012 and uncertainty over whether they will move from High Wycombe to London. Director of rugby Dai Young has overhauled the squad and improved fortunes on the field, while the sale of the club to Derek Richardson last year has seemed to ease the money worries. Wasps face the reigning Premiership champions Saints on Sunday (kick-off 14:00 BST), with King travelling to Adams Park as the visitors' backs coach. "They came through a couple of really tough years and the values instilled in the club - belligerence and a never-say-die attitude - helped them get through that," said King. "It's tough because there is talk of where they are going to be playing. I'm sure that will galvanise the players over the season. "I think Dai has done a fantastic job with the coaches he has in place and the recruitment this year."